This is a new experiment that I’m planning to make a regular feature here. I’m going to combine a little something fun with a little something analytical (but also fun). 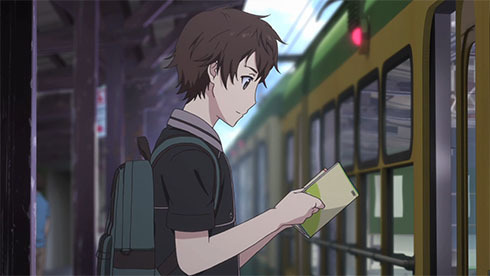 Each week I’ll publish a brief review of some notable instances of transit, place and culture (specifics in a moment) as rendered in anime currently broadcast in Japan and simulcast internationally via the web. I’ve just launched a small business that will specialize in content creation and communications related to these topics, so I’ve become more and more sensitive to the messages embedded in media and popular culture regarding things like public transportation, urban versus suburban/exurban development, attitudes toward conservation and other issues. 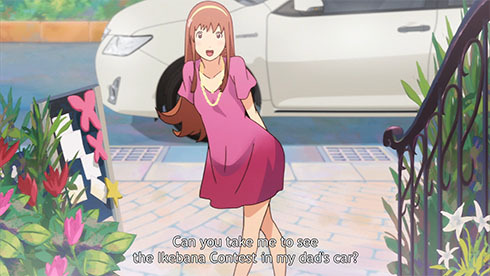 I’ve always loved how anime, especially that belonging to the “slice of life” genre, vividly depicts communities and infrastructure, often with lifelike precision. I frequently watch a scene set somewhere in the Tokyo or Osaka greater metropolitan regions and have flashbacks of standing on that exact train platform or strolling through that shotengai (pedestrian shopping arcade, often covered). I’ll try to capture some of what’s going on at these moments, with the hope to get a feel for creative elements that could be ported back to discussions on real life development. Transit: This one is pretty straightforward. If I see a train, tram, subway or bus, I’ll note how its use is portrayed and any relevant surroundings or events associated with it. Place: Refers primarily to the depiction of third place, locations other than home or work that allow people to meet and engage in social activity. For our purposes, this will often be common urban fixtures such as parks, squares and cafes, but also things that are somewhat unique to Japan, such as the aforementioned shotengai and retail complexes built into transit hubs. This realm will also include more abstract concepts that can be useful for thinking about the physical world, such as ba and the uchi-soto relationship, which I will try my best to not completely mangle with my gaijin interpretation. Culture: This one needs the most clarification and domain boundaries. I’m specifically interested in attitudes toward waste (see mottainai), conservation, environment, consumption, status, and others of this ilk. In order to begin even thinking about behavior change, we need to understand what we value. This will be the most difficult to pin down, but has the greatest potential for unearthing the ingredients of powerful messaging. This may get tweaked as we go along, but that’s the general idea. 始めましょう, let’s begin. Two episodes have aired, and leave no doubt that this show, based on a light novel of the same name, leans to the surreal and absurd. Human civilization has long since developed to the point where it exceeded the carrying capacity of the Earth, and now faces crumbling away of quality of life as once commonplace things like meat become difficult to procure luxuries. Some of the humans, rather than acknowledging this as a consequence of the actions of previous generations, show anger at no longer being able to enjoy these niceties. A young girl sent by the UN, referred to as Mediator, is charged with teaching villagers to raise food and liaising between humans and sweet-toothed fairies that provide “supplies”, various means for humanity to survive in its sunset years. (I did say this was absurd, yes?) A nearby factory, affiliated with fairies but completely automated in its operations, suddenly begins producing processed food and other goods reminiscent of the height of our consumer society that raise suspicion when they arrive in the village. The tone of the dialog suggests criticism of material culture and processed food. The Mediator investigates the factory, where she is led on a tour by a talking loaf of synthetic bread that ultimately laments its poor ability to replace that made from real flour and commits suicide. The factory turns out to have been hijacked by headless and skinless (but still animate) and quite foul-mouthed chickens, bent on controlling the human population through the product deliveries while they secretly use the factory to develop weapons to wipe out all of human and fairy society and take over the world. This show is not for kids. We’ll keep an eye on this one. This is advertisement for Toyota cars. Four episodes in (which are only five minutes in duration each), I have to remind myself of this fact in order to not become too nauseated at the blatant marketing to children of cars as preferred lifestyle choices. I won’t go over each offense, but one that particularly sticks out is the protagonist Pes’ revelation that a three hour driving trip affords him a golden opportunity to spend “alone time” with his love interest. 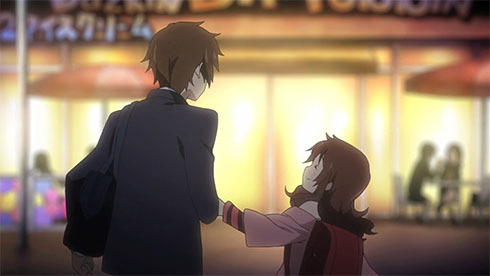 The show makes a point of being set in Kichijoji, the real life, transit accessible Tokyo suburb. The suggestion that a romantic stroll through nearby and beautiful Inokashira Park would be no match for strapping into a sedan and brushing away your cares by using the built-in navigation system is kind of revolting. Pes, an alien, reports back to his superiors something along the lines of cars being humanity’s most ingenious and meaningful contribution to the universe. I will keep watching for the good of the greater cause, and try not to get too sarcastic. This show, based on a manga, comes from the same production team that made Hanasaku Iroha, and features a similar emphasis on strong female characters, as well as detailed and vivid depictions of place. 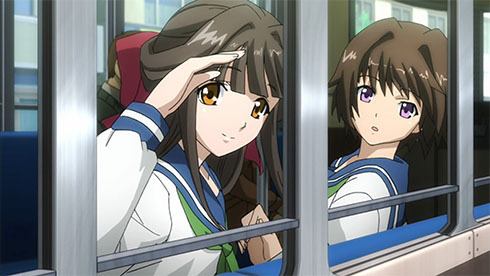 Where Hanairo featured a fictional onsen town based on the real life Yuwaku Hot Spring in Kanazawa, complete with its own one car local train line, Tari Tari takes us to the island of Enoshima, part of the seaside city of Fujisawa, with its recognizable green and yellow train cars of the Enoden line that follows along the waterfront. 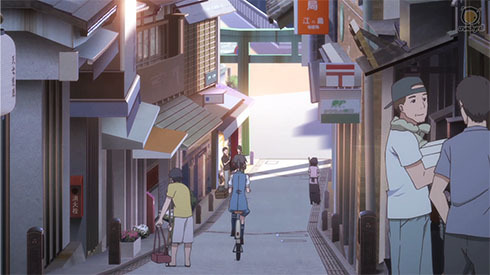 We see a fair amount of walking and bicycling around town as well as characters meeting in public space, notably the real life hillside shopping arcade (screen capture at top) that leads up through torii gates to Enoshima shrines and its famous lighthouse and botanical gardens. 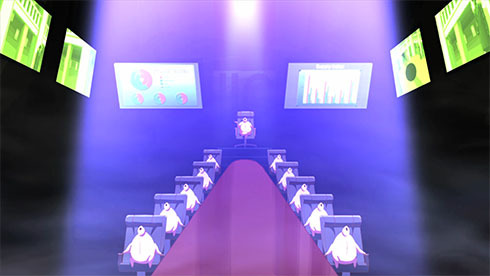 It’s particularly interesting to compare the interpretation of this animator with that of the team behind Tsuritama, a recently concluded show also set in the same place. Based on a manga. Ryosuke is interested in Rokka, but must contend with the possessive ghost of the widow’s husband. 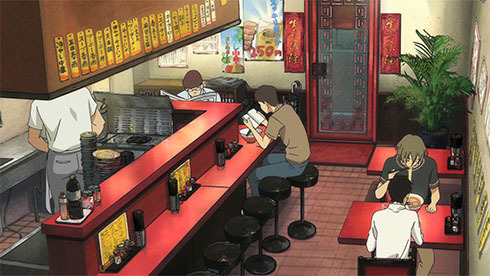 A few scenes feature meetings over meals at ramen and yakitori proprietors. So far (two episodes) most of the action takes place in apartments and Rokka’s flower shop, but I’m hoping we’ll get to see more of the town where the characters live. Based on a light novel and manga adaptation. A high school slice of life story, with some Freaky Friday identity switching thrown in. We see the students walking to school and spending leisure time in public places, including a local commercial district. This is the latest installment of the Muv-Luv franchise, a series of novels, games and manga featuring romantic comedy and robots. Aliens bent on the destruction of the Earth, and the gamine high school girls in mechanical combat suits (メカ mecha) that will save the human race from annihilation. But we also get to see people using a tram to move around parts of Kyoto and the shinkansen, which ultimately get destroyed in combat. Oh well. I’m not sure how much relevant material we’ll have going forward, as combat will likely be the primary focus, but I’ll keep watching to see if anything develops. The kawaii koukousei have nothing to do with it, honest. Ha! Thanks. Not sure if we’ll come up with any breakthrough revelations anytime soon, but figured it couldn’t hurt to inject some frivolousness into what often ends up being a dry and inaccessible topic. Any feedback you have is welcome! Are you a planner/engineer? My mind is officially blown! I thought this was just a crazy idea, but to find someone else who gets the connections is fantastic. I’ll be counting on you to keep me honest. Though I don’t have formal education in planning and transportation, they are areas of deep interest for me, so I’m simultaneously learning and creating. Lol, the best ideas are the crazy ones :).